So we've always wondered about this costume. As a voodoo doll, is someone else controlling you with a smaller version of a doll dressed as you who is already dressed as a voodoo doll? Or are you dressed as a life-sized voodoo doll of somebody else so someone can use you to control the other person? Do you just control yourself dressed as a voodoo doll of someone else and control that someone else? Phew! That's way too deep for us! 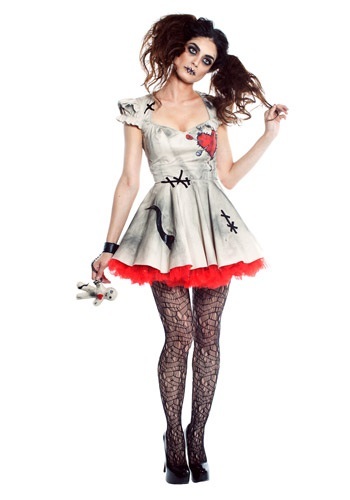 Let's leave the complexities behind and just take this dress at face value: a cute and delightfully creepy costume look. There are a ton of ways that you could customize your costume experience when you go out in this look. You could enhance the look by using some makeup on your arms and legs to make it look like you were sewn together. You could add a terrifying mask to complete your mysterious style, and you could even carry around some oversized pins to let your friends "poke" you. This voodoo doll costume comes with everything you need to get the perfect look for Halloween. It starts with the tan dress with black details and sewn-on black stitching. The attached white skirt has red trim for added detail and the included voodoo doll accessory takes this costume to the next level. Whatever kind of ritualistic creation you'd like to be, just grab some black heels and maybe a pair of torn up or fishnet stockings along with all the black and white makeup you own. Just, whatever you do, don't take any pieces of our hair and try to control us!